Hose package includes two flexible hoses, seven adapters and a transport cylinder. Hose package is designed for leading the cleaning air from air ducts to vacuum makers and filter units. The spiral hoses are made of flexible plastic strengthened with a metal spiral. The hoses are of 5m length and of 250mm and 300mm diameters. Thanks to its flexibility it is suitable for almost any place of usage and can be stored in the one meter long transport cylinder. Also other combinations of adapters, hoses and ducts are possible. 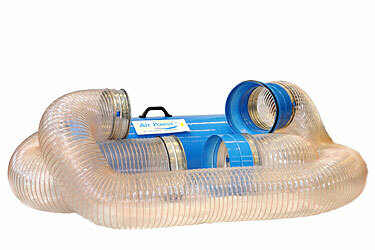 The pieces are designed to suit standard air duct sizes, as are the vacuum maker and the filter unit. The hose package is packed in a transport cylinder which can also be used as an extension for the hoses. The dimensions of the hose package are (packed in the transport cylinder): length 1020mm, width 330mm, height 400mm, weight 23kg. Thus, according to regulations, one man can carry the hose package alone.